How dare you correct my German! I took German for a whole year in high school...ten years ago. I'm practically fluent. "Spass nacht" translates to "fun night" -and as long as there's sausage involved the fun never stops! Ignore that I'm drinking Mexican beer and that it's probably an Italian sausage. This recipe, like me, is only loosely German. My mom used to make this when we were kids and it always seemed especially lazy on a summer night, but I'll be god damned if it's not the perfect marriage of lazy and delicious. As a child I thought cooking with a silver can of Daddy's Natural Light was the living end of culinary magic. Turns out, it's just a hot link of processed American meat boiling in a can of cheap beer. The beer is irrelevant, and since I already know you're poor - use the cheap stuff. I always cook with cheap beer sometimes I put it in the food, said my dad. This is sure to make your apartment smell like a carnival for a few days but if your apartment doesn't smell like a carnival in the summer - you're missing out. Studio apartment chefs listen up, because this is as close to a grill as you'll ever get. Personally I get my sausage from the meat-man at the counter in Jewel-Osco, but I know you can buy these in packs. I trust the meat counter, against my better judgement. Sausage can be a little iffy when concerned about the integrity of meat-content. I'd eat shredded cardboard wrapped in a condom-casing if it was spicy and fennel-y. Getting it at the counter is cheaper when you're only feeding one or two. 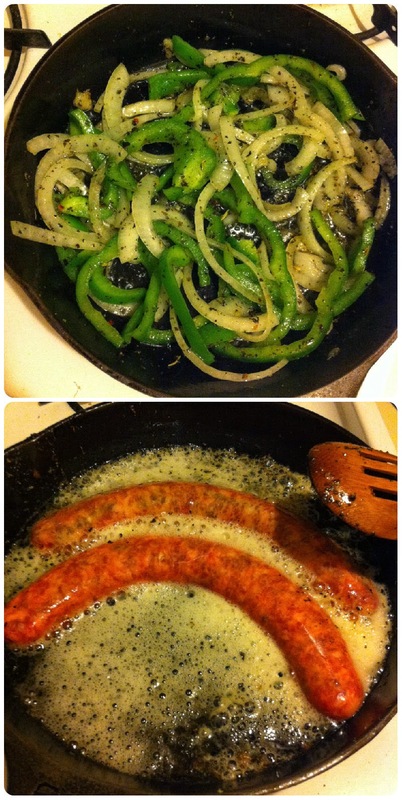 I prefer hot Italian sausages for this because bratwurst is a strange color. Step 1: Heat oil in large skillet. Toss in peppers, onions, salt and pepper. Step 2: In another skillet, boil sausages in a little water. Once at a roiling boil and sausages have browned a bit, add a can of beer. Let simmer and reduce until sausages are cooked through. Remove peppers and onions from heat when done. Step 3: Serve on a pretzel roll or on it's own smothered in peppers. Either way, don't skip the spicy mustard.